Thank you to my coworker Nick for introducing me to Pip’s Original! Fresh warm doughnuts smothered in raw honey and sea salt definitely hit the spot during an unwelcome cold and rainy summer day. 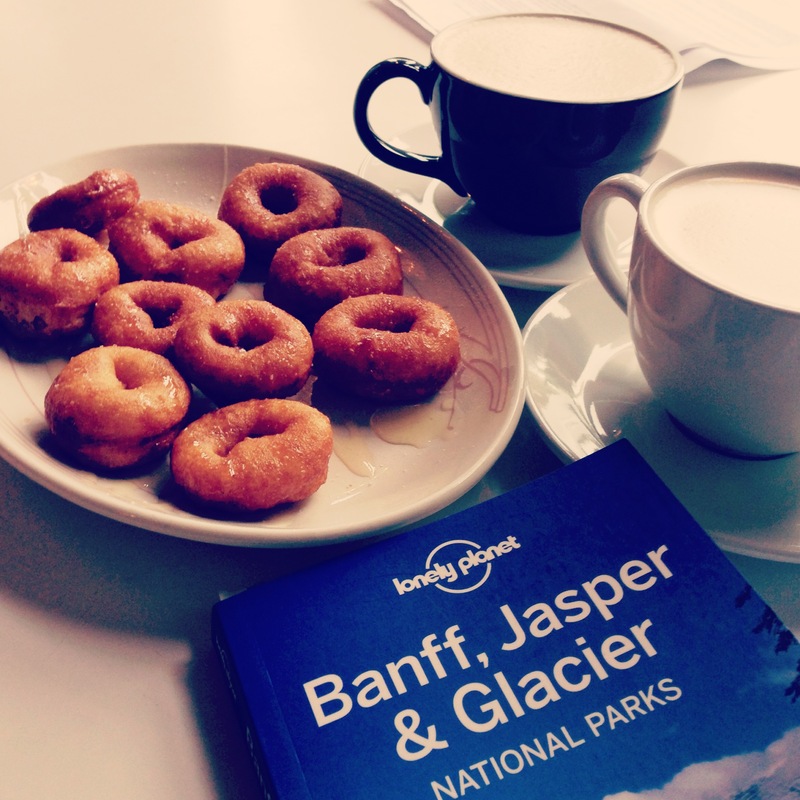 Our original plan was to take the doughnuts to a nearby park and work on our itinerary to Banff and Jasper National Park while sipping mimosas (yeah that’s right!) but we ended up sitting at Pip’s with a couple cups of delicious Chai lattes (we ordered the Ginger Rogers which has Thai chili but it’s very mild so don’t be afraid to try it). It wasn’t super busy the day we went due to the rain so we took up the biggest table by the window and stayed there for well over an hour. The doughnuts were so good warm which is such a nice and rare treat without needing to go to a county fair to get them that fresh. They are also dirt cheap and I love that you can buy them in incremental amounts or buy them by the dozen for $5. They also have cinnamon and sugar ones and another drizzled in nutella (yum!) but so far the raw honey and sea salt is tops for me. If you “like” their page on Facebook, you can find out about their ridiculous deals such as buy a chai latte and get a dozen free doughnut days (usually on a Friday). Price: We paid under $5 for the doughnuts and each of the lattes. Portland sure loves to eat out for brunch during the weekends and the hour long waits are considered normal at some locations. I personally don’t like waiting that long so I try and find spots that serve great food without the long lines. I’m not talking about the basic eggs/bacon/hash browns either which I can get for $2.95 at the dive bar down the street. I want something a bit different that can’t be replicated at home while I’m half asleep in my pajamas. Enter EastBurn which serves brunch from 10 am-3 pm on the weekends and the wait was non-existent when I went there. We left after 11 am and there were still so many tables open which is totally unheard of at some other brunch spots. I will be sitting on one of the hanging basket chairs the next time I go there. How fun is that?! 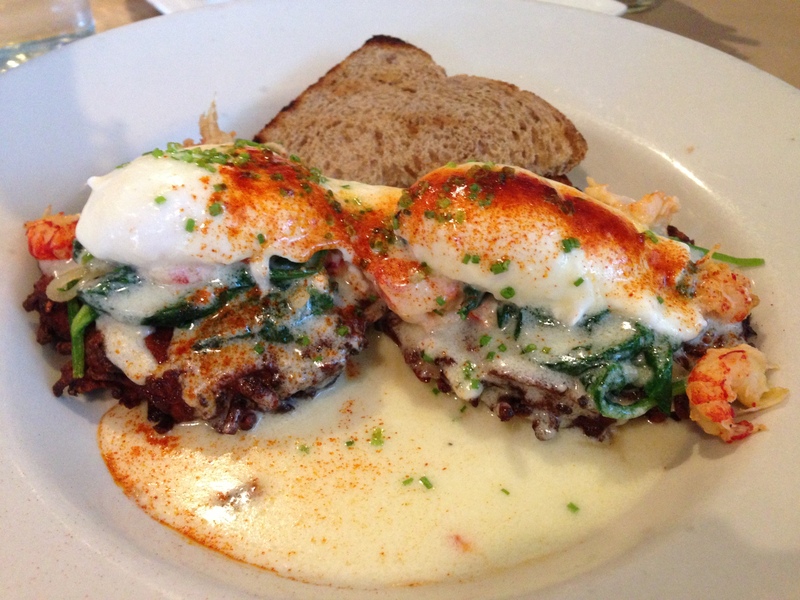 My order is always a savory item and if there is eggs benedict on the menu I will order it 95% of the time. I love trying new versions of it and EastBurn did not disappoint. I was very satisfied with my order of Maine lobster and crawfish benedict which was served on potato pancakes instead of an English muffin and let me tell you, it was fried to a crispy perfection. It is served with spinach and a fontina cheese sauce ($12). I certainly could have loved more lobster but I know I wasn’t going to get a whole lobster tail so I can’t complain too much. It is a very rich and decadent dish that I would eat again in a heart beat. I don’t think the toast was necessary and seems out of place with this dish. The bf ordered the brisket hash ($10) with house-smoked beef brisket, veggies, potatoes and toast. He managed to eat half of it so the portions are not skimpy at all. He also enjoyed the “build your own bloody mary but if that isn’t your thing, mimosas are $2 with any breakfast purchase. They also start you off with complimentary mini scones (we got cranberry) which were delicious! You can also accumulate points with your purchases at EastBurn to use towards rewards so sign up on their website. I have no idea what the rewards are though because I don’t think I’ve reached the needed points yet but I signed up anyways and received 100 free points. I should eat here more often than I do, I think I avoid Alberta Street as a driver because of the cyclists and the lack of a proper bike lane on that street. There is only so many blocks I want to drive at 5 miles an hour and I get a little antsy around the 30 block mark of being behind a bike. Don’t get me wrong, I get along with bikes and I love them but you are pretty screwed as a driver on this street if you are behind one. Now that I’m done griping about traffic, I can talk a little about my delicious lunch I had a few weeks ago. My coworker drove (yay!) 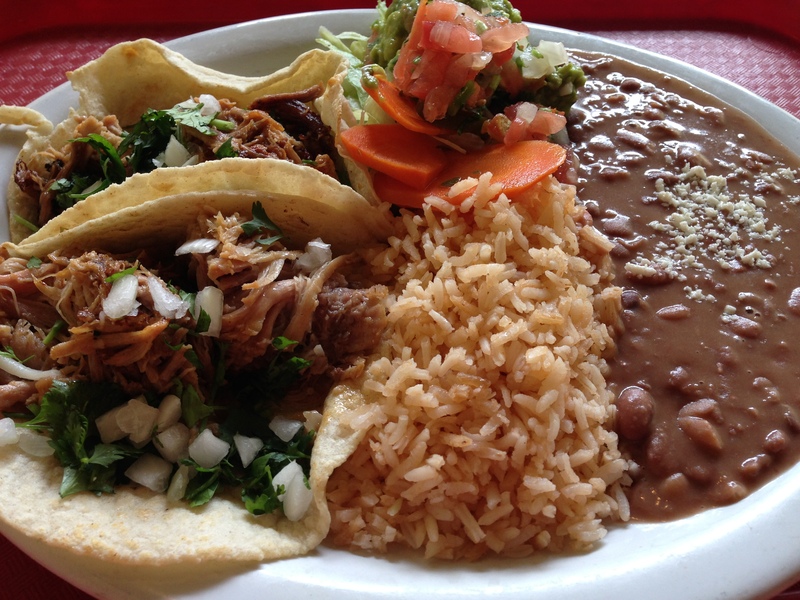 and we both ordered the carnitas tacos. Yes, she got stuck behind a bike in case you were wondering! My tacos were delicious and not greasy at all. I ordered the lunch special (I think it was $6.95) and got rice, beans and a drink with my meal. I definitely needed salt and hot sauce to flavor up the beans but they were filling and I ate pretty much everything on my plate. It’s always a good meal and good service here. Ok, so what if they are only open until 2 pm on the weekdays and 3 pm on the weekends, it’s still considered all day right? I have to thank the Chinook Book for introducing me to this little cafe. I’m a sucker for 2-for-1 meals so the coupon in last years book got me in the door and the food made be come back for more. I decided to use it for a brunch meeting and chose the most delicious eggs benedict florentine (pictured above for $9.95). The potatoes were to die for and I wasn’t sure if it there were bits of bacon in it or just caramelized bits of onion or something but I ate it all even though I was a vegetarian back then. My coworker wasn’t sure either and suggested I ask the waitress but truth be told I didn’t really want to know. Oh what a year has done to me! My love for bacon has reappeared and may never go away again. My latest visit I decided to try the catfish hash ($11.75) consisting of pan-fried catfish (duh), two poached eggs, grilled onions, peppers & potatoes , and then topped with creole hollandaise sauce and served with toast. It was a spicy and filling meal that had incredible flavor and would order again. I was not able to finish this even with a little help from my boyfriend because his salmon benedict filled him up too. You definitely leave this place full because we didn’t end up eating again until dinner time. There can be a wait because the space is pretty small and there was only one person working all the tables so don’t be in a rush if you decide to eat here. Thank you to Amber for telling me about this little known yet in many ways unknown spot in SE Portland. 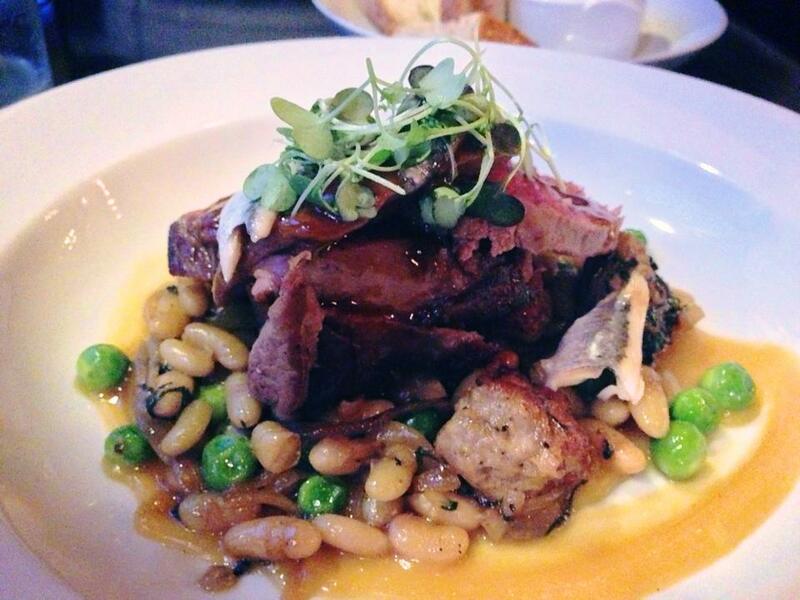 Prepare for a wait during the weekend because it’s a busy place which only means one thing…great food! Now, I’m not sure what I was thinking when I ordered 2 kinds of potatoes during my first visit there but I was hungry and after 20 minutes of waiting I felt I could eat it all. Yes I failed at that but I got to eat my first rosti there, a classic Swiss potato dish, and anyone that knows me can tell you that I just love potatoes in all forms so I was super excited to have it prepared in a different way than the normal hash variety. I ordered the Rain Man and Sun King ($10.50) which had sautéed vegetables (served Al dente) with greens and roasted potato hash topped with poached egg finished with aged balsamic and Parmesan cheese. Super delicious! The service was great and the wait staff are very friendly so you always feel welcome when you come in. They are now serving dinner a few times a week so I’m looking forward to trying that out too! P.S. I heard their bloody marys are quite tasty if you like them! My friends enjoyed them but I’m not big on tomato juice so I didn’t try it. Hen. Honey. Dish. Chick. Harlot. Those are just some of the translations of the word Cocotte. Brilliant right? I took the bf out for dinner there recently to celebrate his birthday and it was a wonderful experience. Our server came by to take our drink order shortly after being seated in an intimate corner but nothing really stood out for me. My favorite beverage, vodka, was not listed on any of their signature drinks so I needed some coaxing into trying something else. 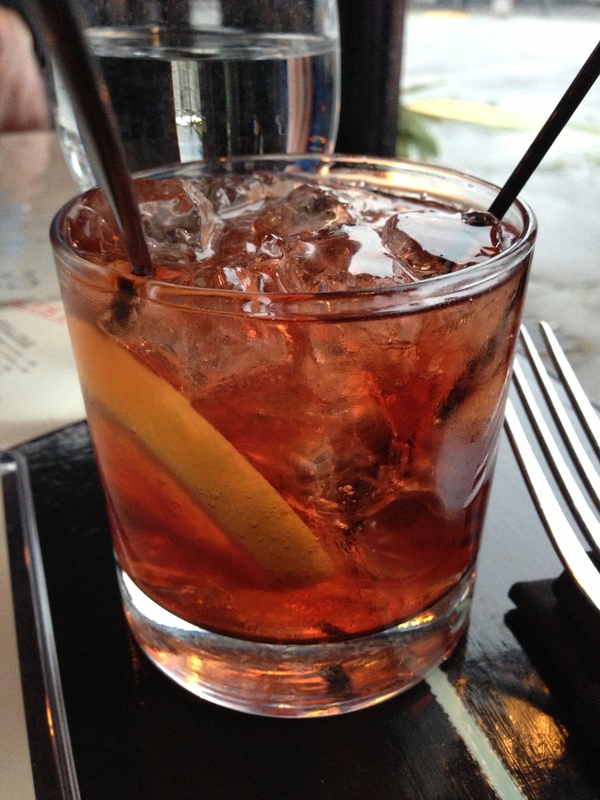 The server recommended the “Mère” ($9) made with Hendricks Gin, Dubonnet Rouge and Lemon (London Late 19th Century). He had a nice bearded face that I could trust so my normal vodka drink was swapped out for gin and I actually liked it. The bf ordered the “Biter” ($9) made with Beefeater Gin, Cheartruse Vert, Lemon Juice and Home Made Absinthe Bitters (London Early 20th Century). That drink was like jet fuel. Wow! Needless to say he got a buzz from the Biter. Part of the reason I picked this place was the French inspired menu because the bf has never eaten escargot in his life so I had to change that and we both love foie gras so indulgence had to be repeated when given the opportunity. I’ve had escargot a couple of times but it was never served like this! 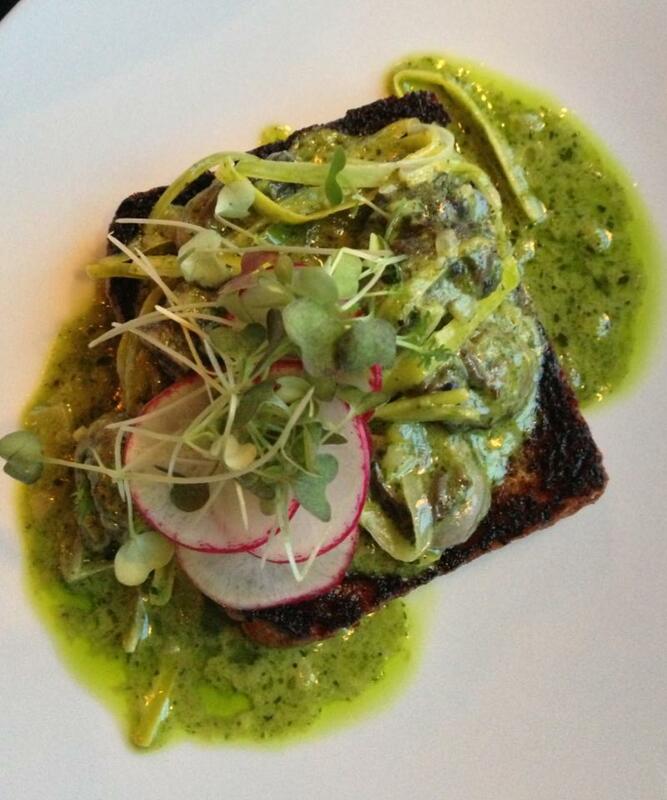 Their escargot ($9) was topped on house made brioche and garlic & leek pistou. The color took me by surprise as it is a bright green but it was fresh and very flavorful. 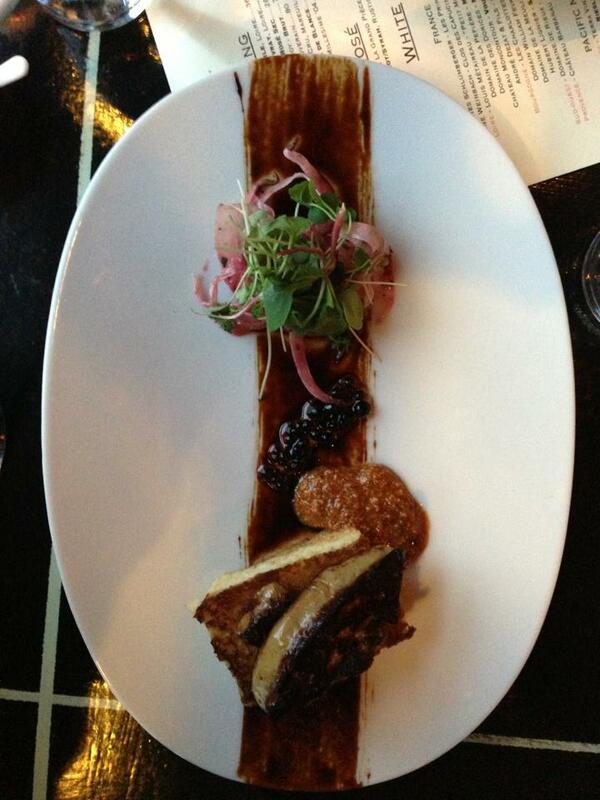 We also ordered the sonoma county foie gras ($13) which is pan roasted with balsamic, house brioche, berry dressed fennel salad and almond butter. There were so many flavors and textures going on that every bite was different yet the same, that being delicious. Both our appetizers were fantastic and we still had our main orders to look forward to. The bf ordered the pan-roasted lamb leg ($24) with ragoût of flageolet bean with boudin blanc & foie gras, meyer lemon purée, spring shoots & boquerones . He polished the entire plate off so that says something right? I decided to order the poulet en cocotte ($25) because I had to see what all the fuss was about after reading reviews stating this dish can sell out before the night was over. 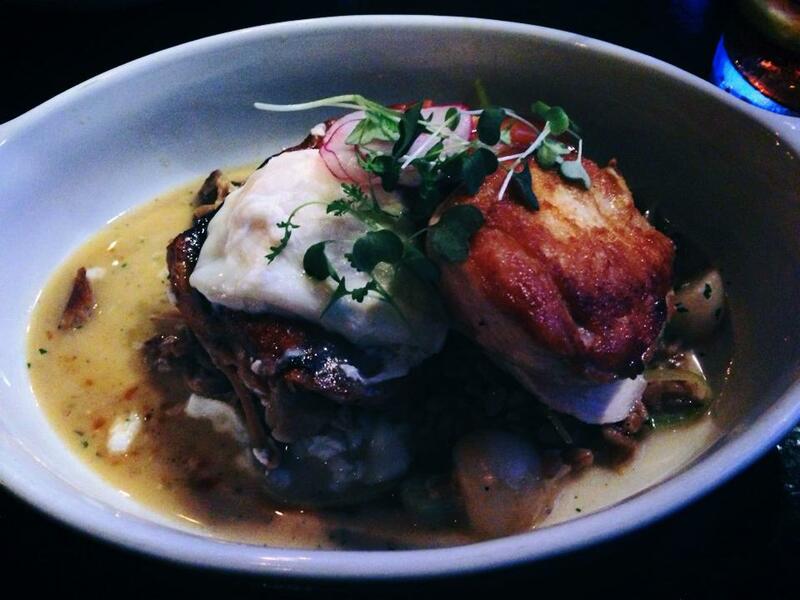 Their chicken is a half bird preparation of pan roasted breast, confit leg, farro risotto with seasonal produce, chicken demi-glace and a slow poached egg. This dish is bomb! The confit melts in your mouth and everything was cooked perfectly. The breast was still moist and we even noticed the pearl onions were still crisp yet cooked throughout. I even ate the radishes on top and I don’t care for radishes. Seriously ridiculous delicious. I couldn’t finish it off so the small portion I had left was boxed up after the server and my bf suggested that I could make breakfast with it the next day. I wasn’t sure that was possible but I took it anyways because I had to try and eat it the following day. FYI, I made the best tasting omelet of it for Sunday brunch. My only regret is not saving enough room for dessert. Lucky for us that they gave us madeleines to go so you can enjoy it later. Nice touch Cocotte! I love this place. It’s cozy and charming with fantastic staff to help you along the way in deciding what to try. The prices are reasonable for French food (dare I say cheaper than I thought) and the portions were ample. There is nothing more I hate than to going out to eat, dropping good money yet walking out still hungry. Trust me, it shouldn’t happen here! Gosh, I haven’t written a bad review like this one in a loooongg time. In fact, the last restaurant I disliked this much closed down (Afrique) and is now a pub (Tavin’s). At some point, bad food coupled with bad service will catch up to you and if the owner’s don’t start reading customer reviews and realize there is an issue they deserve to lose money and eventually close their doors forever. The night started out fine. We got seated right away and our server (Alysha) seemed nice enough and brought out water in a timely manner and said she would take our order shortly. 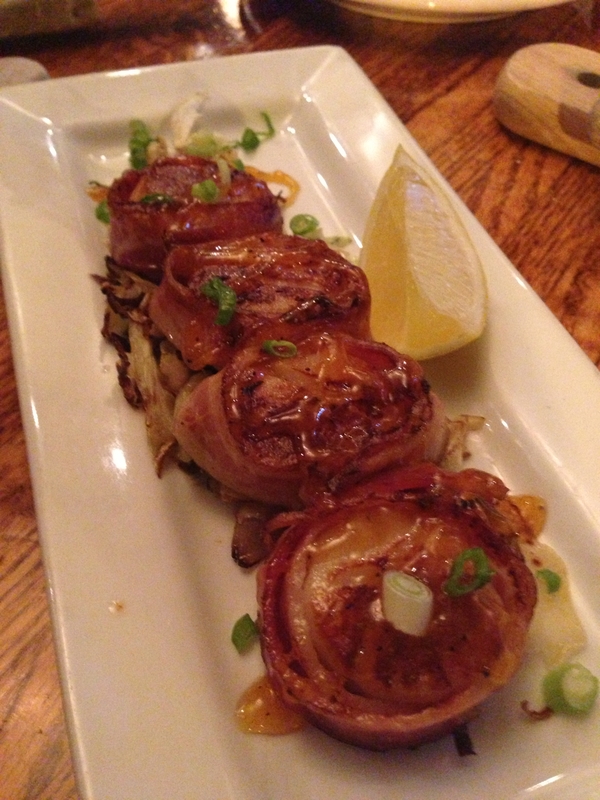 We decided to try their scallop starter wrapped in bacon (4 medium scallops which calculated close to $2.75 a scallop). It arrived in a reasonable time and then things went downhill from there. Tables around us, some seated after us, were receiving their main courses before us. In fact, the couple beside us even paid and left before we even got our main courses but then again, they had a different server. Let me add that we didn’t order anything too complicated or time-consuming to put together. I ordered a veggie burger (frozen patty) and my bf ordered the kobe beef burger and the fries that came with the meal were frozen too. It took over 45 min after we got our starter (and we placed the entire order at the same time) for our food to arrive. She knew our order was missing and told us she would check on the status but never came back to tell us how much longer. I’m sure she never put it in. She gave us no explanation at all. She kept walking back and forth to her other tables (still ignoring us) and each time she did, we got madder that she didn’t have the decency to tell us what the hell happened to our food. Our used starter plates and utensils sat at our table for over 30 minutes because she couldn’t bother taking the dirty dishes off our table which is just plain lazy. When we finally got our meal, she offered no apology for it taking so long and still had no explanation either. I guess we should have just been grateful to have received it at all. My burger was meh. I liked the bread but the frozen patty was a bit dry. They charged me an extra $1 for the cheese and $1 for sweet potato fry substitution which brought my meal to about $12. I should have gone to Little Big Burger and saved at least half of my money. The kobe beef was even more disappointing. My bf stated it was dry inside and burned outside and that plate of food costs about $15-16. Their website doesn’t include the prices on their menu, a strategic measure I’m sure because there is a lot on their menu that is over priced for the quality they serve. We wanted to get out of there so I had the restaurant.com coupon on my phone ready to scan along with a debit card so we didn’t have to wait another 10 minutes for her to come back to take our money. What I hate most is she earned 18% whether she gave good service or not. Don’t waste your time or money here. Read the reviews and you’ll notice 2 extremes. You have a 50/50 chance of getting pissed off and wasting your money or being happy and claiming it’s the best meal you’ve ever had or the best place you’ve ever eaten (no seriously, people have written this sh$t). Now, when I read things like that, I can’t really take their opinion seriously because Portland is a foodie city and if Orenco Grill is the best experience you’ve had then I feel bad you haven’t done your stomach or wallet a favor. They deserve better and so does everyone walking through their door. Here is a picture of the scallops. I didn’t take a picture of our mains because we were hungry by then and a bit angry but trust me, it’s nothing to write home about.